April 2011, in my messy, love filled lounge. My amazing daughter, Alicia, 18 days old, in our first real sling. This photo is special to me as it’s take a few moments after she nodded off, her first time in there. It was a inexpensive VSL stretchy wrap. We our daughter had a an undiagnosed tongue tie, so fed a lot and in the rare moments she was not at the breast, cried hard. It was tiring for us all, not the lack of sleep so much, as the sadness that I couldn’t fix whatever was upsetting her. Slings made that far less of an issue. In the sling she was next to my heart. She might have still cried, but she on me, and with me in the sense that the sling held us both close. I shed tears as well sometimes, but my arms where free to stroke her face, pat her back, hold her close. 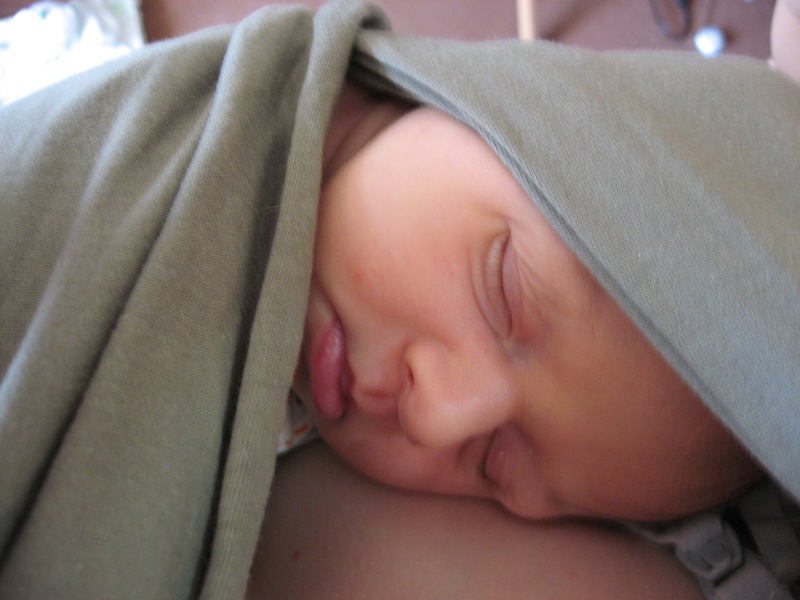 We could start to go for walks with her comfortably snuggled against my breasts, and she loved the movement. She cried a little less. It took a long time to get the hang of breastfeeding in the sling, but once I did there was something amazing about trotting about the woods with a baby nuzzling away, occasionally pulling off to look at a shadow or tree, then returning to my warmth. Our daughter is now 2.5yrs old, and doesn’t love the slings any more, in fact, as soon as she started to walk she loved nothing more than walking next to us. She knew that my arms and heart would always be open, so she didn’t have to stay in them to be sure of them. I hoped the ‘sling strike’ would end, and occasionally she’ll come in a ring sling for a few moments, but then my girl is back to exploring. It’s her, wonderful her, telling me what she needs. One day she’ll tell me she needs it again. She now has a doll sling of her own, and is touches my heart deeply to see her kiss her dolls head in the sling. It’s been years since I regularly carried her on my front and kissed her forehead, but something in that gesture has stayed in her mind, and now she does this to her beloved dolls. Its clear we both have soft, warm memories of those early days.